Aces of the Luftwaffe is, to put it bluntly, as bonkers as a bag of frogs. It starts with a warning that all events and people portrayed within it are fictitious, but unless you accidentally slipped sideways out of a twisted version of The Man in the High Castle and into our world this morning, it's safe to say the developers could have skipped the warning. 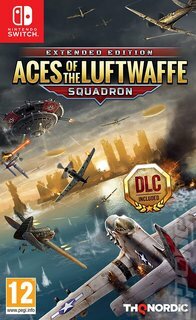 Aces Of The Luftwaffe: Squadron is about Nazis invading New York with UFOs and giant flying steam trains. Your job is to start at the bottom of the screen and fly towards the top, shooting down as many of the flying Nazis in your way as possible. It's bullet hell for the 21st century, with the bonus of our newfangled massive widescreen tellys to help you wrap your eyes around the bright 'splodey action popping out of the display. A nifty little twist on the old bullet hell formula is that you actually control not one, but four different planes. You're in charge of the squadron leader, but once your aircraft is shot down you take control of another one, effectively making each plane one of your lives. The punishing twist is the fact they're probably the most ill-suited pilots ever to get behind the stick. Mark Taylor suffers from random bouts of sickness, meaning you have to periodically slow him down so he can regain his composure; Steve Davies periodically falls asleep and must be protected until he wakes up; John King suffers from psychotic breaks, during which he'll furiously kill friend or foe alike and Melissa is scared of heights, meaning she'll occasionally just leave combat for a bit. If you prefer you can have three of your pals jump in to help out. A Nazi invasion shared is a Nazi invasion quartered, after all. If you don't think the Nazis got a sound enough thrashing the first time around, this one's for you.